Osteoarthritis is a chronic condition in which tissue known as cartilage breaks down. When this tissue deteriorates, it leaves the bones to rub against each other, causing pain and stiffness. If you have osteoarthritis, you’ve probably heard something like this definition from your doctor. The disease may also be referred to as osteoarthritis, degenerative joint disease or degenerative arthritis. In general terms, osteoarthritis is considered to be a chronic condition. It is important to make the distinction between chronic and acute conditions. Illnesses such as a cold or the flu are acute conditions because they have a clear beginning and end as well as a specific cause, such as a virus. These illnesses can be diagnosed with special tests, and many of the most common ones can be treated with drugs or medical procedures. Chronic conditions like osteoarthritis, on the other hand, often last for several years or even a lifetime. All of the causes of osteoarthritis aren’t yet known, so there may be no single, simple treatment. In fact, treatment for osteoarthritis may require a variety of medications and other measures, and these may change over time. Because this disease is long-lasting and can affect your day-to-day life for years, it is crucial that you take an active role in managing it. You can make a difference in how you feel by monitoring your symptoms, following your treatment plan, and be dealing with the daily challenges the condition brings. Like other chronic conditions, osteoarthritis has no single, specific cause. Instead, there are several factors involved in the disease, including heredity and lifestyle. It may take a combination of these factors to eventually result in osteoarthritis. Heredity – Scientists believe that in osteoarthritis, as in many other diseases and conditions, heredity may play a role in the disease. Researchers are studying several genes that may be connected to osteoarthritis. The outcomes of these studies may help predict who is most likely to get the disease. Obesity – You probably already know that being overweight puts you at risk for heart disease and certain types of cancer, but it can also have a profound effect on your joints. The reason is that your major joints, such as knees and hips, already bear the brunt of your body’s weight as you move through normal daily activities. Being overweight puts even more pressure on these joints. Injury and overuse of joints – Sometimes repetitious movements or serious injuries to joints can lead to osteoarthritis years later. Some full-time athletes, for example, may injure the same joints over and over again, causing damage to the joints, tendons, and ligaments that speeds up cartilage breakdown. There are more than 100 different types of arthritis and related diseases. It is important to know which type of arthritis you have so you can treat it properly. If you don’t know which type you have, call your doctor or ask during your next visit. 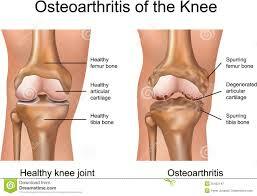 Osteoarthritis – The most common type of arthritis is osteoarthritis or OA. OA affects about 21 million Americans. OA is sometimes called degenerative arthritis because it is caused by the breakdown of cartilage and bones, causing pain and stiffness. OA usually affects the fingers and weight-bearing joints, including the knees, hips, back, and neck. It affects both men and women and usually occurs after age 45. 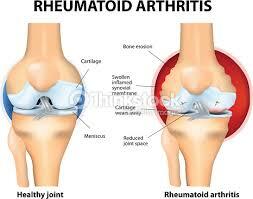 In rheumatoid arthritis or RA, an abnormality in the body’s immune system causes inflammation of the joints. Inflammation begins in the joint lining or the synovium, and over time leads to damage of both cartilage and bone. Rheumatoid arthritis often affects the same joints on both sides of the body. RA affects about 2.1 million Americans and is more common in women than in men. Fibromyalgia is a disease that causes widespread pain and distinct tender points, which are placed on the body that are highly sensitive to touch and produce pain. People with fibromyalgia usually have fatigue, disturbed sleep, and stiffness. Fibromyalgia is a common condition that usually affects women and it does not cause muscle or joint damage. Lupus is a disease that affects the skin and joints. In some people, lupus also affects the internal organs such as the kidneys, lungs or heart. Lupus affects women about eight to 10 times more often than men. Symptoms often first appear in women between ages 18 and 45. Some of the more common symptoms include a rash over the cheeks and across the bridge of the nose; scaly, disk-shaped sores on the face, neck and/or chest; abnormal sun sensitivity; kidney problems; and forms of arthritis. Bursitis and tendinitis are caused by irritation from injuring or overusing a joint. Bursitis affects a small sac called the bursa that helps to cushion the muscles and tendons surrounding the joint. Tendinitis affects the tendons that attach muscle to bone. In osteoarthritis, the cartilage begins to break down, usually gradually. As the cartilage wears away, the bones become exposed and rub against each other, which leads to pain. The deterioration of cartilage also affects the shape and makeup of the whole joint, so that it no longer functions smoothly. You may notice a limp when you walk, or you may have trouble going up and down stairs. This deterioration puts additional stress on the joint as it moves. Other problems can occur inside the joint as cartilage breakdown affects the joint components. Fragments of bone or cartilage may float in the joint fluid, causing irritation and pain. Bony spurs or osteophytes can develop on the ends of the bones. Fluid inside the joint may not have enough of a substance called hyaluronan, which may affect the joint’s ability to absorb shock. And although inflammation is not a main symptom of osteoarthritis, it can occur in the joint lining in response to the breakdown of cartilage.